Recently I had gone on a visit to Cuba. I have noticed some sellers selling old Cuban watches. As I was looking through the watches one of them had an egg shaped antique stuff which was for sale. I was interested to have a closer look at this object. As I started to enquired more regarding this object.,he mentioned that he had directly taken this object from a Chinese family who had settled in Cuba in the early 1900s. This object along with a very small heavy teapot was used as decorative objects in the living room. On taking a closer look the egg is made up of porcelain with most of the surface in gold colour with very fine and tiny intricate weaving thread. 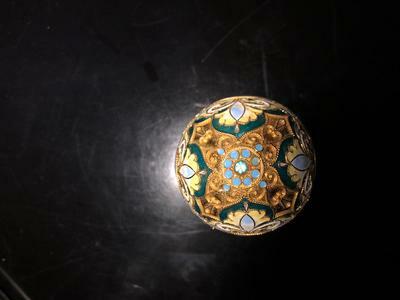 Rest of the egg has enamel like colouring and very beautifully decorated. The top and bottom of the egg has two blue coloured stones studded. These stones are still very shiny and matches the colour of the enamel of the surface. The egg in the middle has four circular areas made of porcelain with possible hand painting. One of the circular area had has a hand painting which shows XB alphabets. These circular areas are surrounded in gold colour with intricate woven strings as boarders. One of the porcelain circular area in the middle is chipped off showing gold colour to the base of the porcelain. It is decorated with various colours from sky blue to dark blue, green and yellow and by the gold material all around it. The person who I've taken the egg guarantees that he had picked this egg while the families house was recently cleared recently. It also comes with a stand with four legs on it in. the stand is also golden in colour. The egg can be placed on the stand for decorative purpose. The stand along with the egg looks very beautiful and the gold colour shines through even in the dark. There is no fading of colour noticed at all. Tried to search online to get any history regarding this egg. I was trying to search the Internet on the two alphabets written on the porcelain which states X B.
family who owned the egg or probably of the person who made the egg. I'm not a collector and not aware of any websites or people who deals with Chinese antiques hence as I was searching on google I came across your website. Hence I have decided to get an opinion from you first. As I have never collected and do not have any information regarding antiques, I find it extremely frustrating to search the value of this. I have only been searching for the details of the egg in the last few days as I mentioned earlier I'm not a collector or do not have any shops. I would like to value this antique achieved item as this could be a very valuable find. Also there are very few Chinese families that settled in Cuba in the early 1900s. Thought this egg could have some history behind it as well. 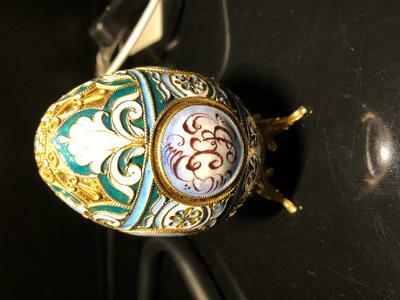 This egg was placed with a very heavy and very small teapot made of some kind of metal polished or painted with shining blue colour material and embedded with diamond like stones. inside of the teapot is lighter in colour and possibly enamel. These two objects came from the same family I purchased both of them from the seller thinking they could be history behind both these items. 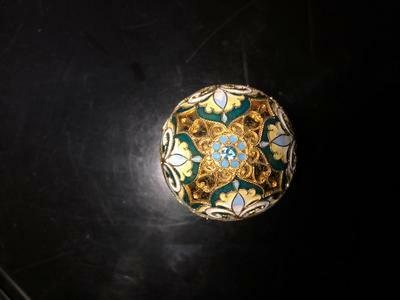 This is a Russian style silver and cloisonne enameled egg. It could be made in China or elsewhere. So the initials in the monogramme says "HV"
these richly decorated cloisonne eggs of unknown origin appeared to sell for $200-$400 USD in the main at auction - and these were fairly ordinary ones without jewels. Obviously, finer examples sell for much more - from $500 USD to the thousands. Real Faberge eggs are almost priceless of course. 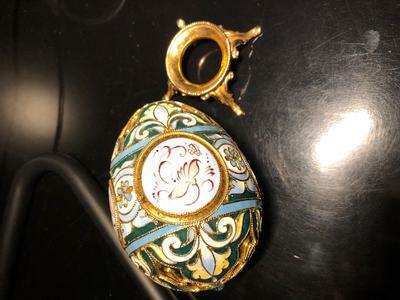 So do some research as Liveauctioneers.com on cloisonne enameled eggs and see what you find. Do the same with cloisonne enameled tea pots.